GreenPowerMonitor will attend the 8th International Photovoltaic Power Generation System Expo (PV System EXPO) alongside our partner Innergy. GreenPowerMonitor will be pleased to discuss and demonstrate the value our solutions can add to your PV assets through our controls, performance monitoring, portfolio management and O&M tools. 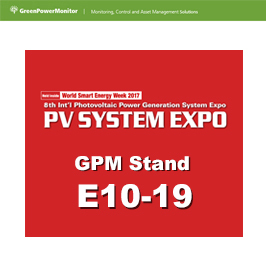 Please, do not hesitate, stop by #E10-19 booth or contact us through my email masa.misawa@greenpowermonitor.com to schedule a meeting. Also, please let us know if you are not planning on attending this year’s PV SYSTEM EXPO. We would love to schedule a face visit with you at your office following the show.